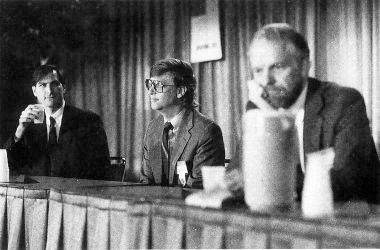 John Warnock is a Xerox PARC alumnus, the brilliant inventor of the Postscript language and co-founder of Adobe Systems Inc. This soft-spoken, academic type was a tremendous source of inspiration to Steve in his approach to graphics on computers. Steve held Warnock as a mentor and played an instrumental role in the founding of Adobe, via a massive early investment by Apple. They remained in good terms, even though Apple and Adobe increasingly antagonized one another because of the issue of Flash on iOS devices.